We had been searching for a Falcon daughter to accent our band of mares; one who embodied characteristics Maplewood appreciates. In 2013 we found Falcon’s Promise ORA. 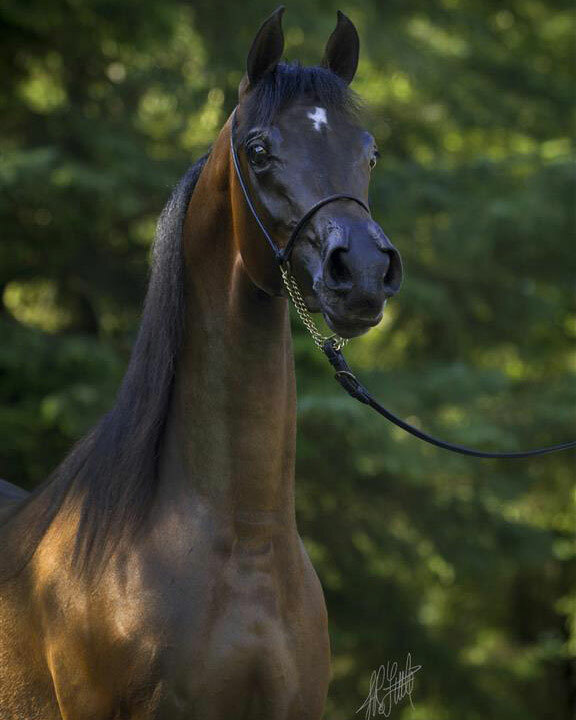 By the National Futurity Champion Falcon BHF, famous for the extreme quality of his daughters, and out of the Chilean beauty LL Albufera, herself a National TT mare and Youth National Champion, this filly brings fire, stature, flare, height, carriage and attitude to our program. Trotting in hand, tail over her back, vertical and lengthy neck with the finest throatlatch and soft poll imaginable, David Boggs states, “One of the best neck and shoulders in the breed.” Jeff Little reminisces, “A rare shoulder like Echo Magnifficoo.” And to top that all she’s dark bay! Her pedigree sealed the deal, three lines to Bey Shah with a Polish bottom line leading to Negatraz and Touch of Spice, one of our favorite DWD Tabasco daughters. This filly has motion on all fours. We look forward to utilizing her as a watershed mare transitioning to the next generation of Maplewood type. This entry was posted in Champions, Mares and tagged mare on October 15, 2013 by Anita Enander.